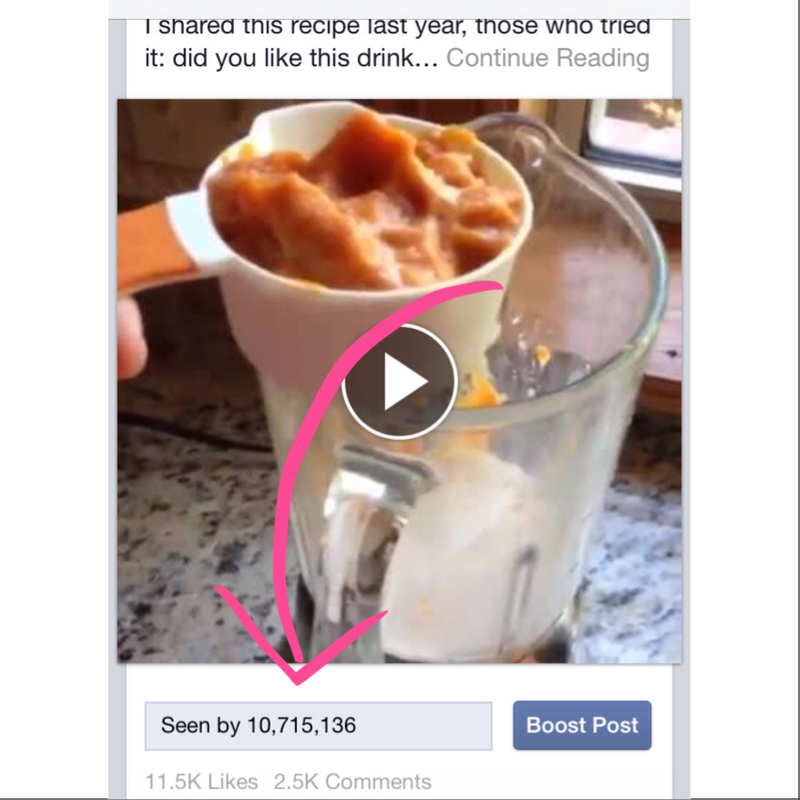 I posted this video two days ago on Facebook and I have been completely blown away at it’s popularity! As of 11pm tonight, the video has been viewed over 11 MILLION times and shared over 91,000 times in 48 hours. Crazy! I have been making it each morning. 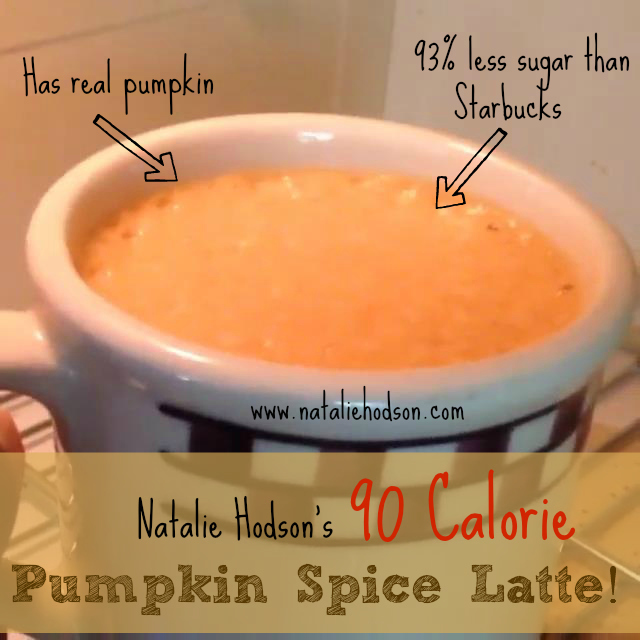 Instead of using your calories on a sugar-heavy Starbucks drink, try this instead and save on cash too! I shared this recipe last year, those who tried it: did you like this drink? What did you think? Do you have to use the whey protein? Hey Amy, I like adding the whey protein powder because it adds some protein to my snack (which keeps me full longer) but also because it gives the drink sort of a frothy/foamy consistency similar to a latte. I like the MRM brand because it doesn’t have the protein powder aftertaste that many protein powders have (best prices are on amazon.com or bodybuilding.com). So, the whey isn’t necessary but I do think it makes it taste better. I LOVE it! As soon as I saw your post, I headed to the grocery store for pumpkin puree. Only downer is my protein powder and unsweetened almond milk have higher calorie count than yours. Nonetheless, still a wonderful option over Megabucks… I mean starbucks. Also, I’ve been running and cross-training since the end of May but haven’t really seen the effects that I had hoped for – tone muscles, weight loss, etc. I’m 43, so I get that it takes much more effort to trim up than it did just a few years ago; but I’ve never ran before so I thought for sure that would melt the fat away. I could tell my muscles were shaping up but just less than I planned on. Only six days ago I stumbled upon your site and started looking through your notes. I saw a comment on macros, so I proceeded to look it up. Then I found the IIFYM calculator. I had never paid any attention to these ratios. Per the calculator, I wasn’t taking in enough calories, nor was I getting the appropriate ratio of carbs, protein & fat. I saw a lot of recipes that you shared that I thought I’d love, so I got my notebook out, made a list and headed to Trader Joe’s. Made your buffalo and salsa crock pot chicken dishes, pre-workout protein shake and much more. Today is my fifth day of recording my macros and I have noticed major changes. #1 – the sore calf muscles I’ve had for the past month or so from running has almost completely diminished. #2 – I’ve lost 1 lb. #3 – I feel like the fat is just disappearing (I’m much less bloated feeling)! I had a really hard time believing that I needed to eat that much food. I’m a really slow eater so I feel like I’m eating all day long and it’s hard making sure I eat because I’m not always that hungry. But I’m getting it now. I have to exercise or my hormones and age will get the best of me but now that I know what I need to do with my diet I get to reap the benefits even more so. I would love to share this with some office coworkers. I was wondering if I could prepare it ahead of time, blend it up then put it in a container and then shake it (with the lid on ) (; then micro wave it. We have no blender at work. Thanks…looks like a nice fall treat. Hey Mary, you bet! I think it would taste just as good that way. Let me know how they like it! Incredibly delicious! Tried it this morning, however I tweeked it a bit. I used chocolate unsweetened almond milk, no stevia or sweetner and I also used my own vanilla protein powder! I still need to perfect it, but MMMM delicious! So glad you liked it! Thanks for the feedback Roxanne! I’m curious about the whey as well. Hey Stephanie, I like adding the whey protein powder because it adds some protein to my snack (which keeps me full longer) but also because it gives the drink sort of a frothy/foamy consistency similar to a latte. I like the MRM brand because it doesn’t have the protein powder aftertaste that many protein powders have (best prices are on amazon.com or bodybuilding.com). So, the whey isn’t necessary but I do think it makes it taste better. SOO good – I am using Isopure unflavored whey and using two scoops to bump up the protein – Enjoying one right now as my afternoon “snack” and will have the leftovers in the morning. Thanks for sharing. You bet! So glad you like it! I don’t like coffee how bad would it be to use chai tea? I love it!! The only few changes I made are I use unsweetened unflavored almond milk,1 tsp pupumpkin pie spice, and 1 scoop gnc total lean 25 pumpkin spice protein powder! Sooo delicious! I LOVE this recipe!!! Only difference for me is that I can’t do soy, so I use my Shakeology powder instead of the MRM! Thanks so much for this 🙂 Bring on the fall weather! I made your pumpkin latte this AM and it was amazing! It totally hit the spot. I’ve been craving pumpkin coffee/latte for over a week. I got a pumpkin coffee from Dunkin Donuts and threw it out, it had to have like 60 grams of sugar. Thanks for sharing!! Thanks for this recipe! It really hit the spot this morning and will keep me in line on a day I can tell I’m in an indulgent mood! Saving this for sure!